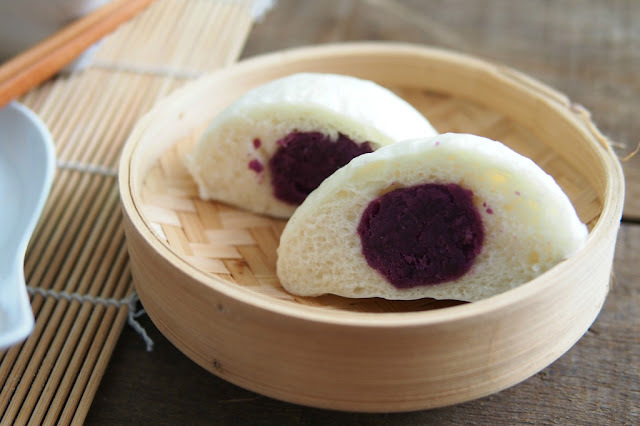 I saw these pretty purple potato buns picture on Pinterest, unfortunately the recipe is in Japanese. So I had to figure this one out. 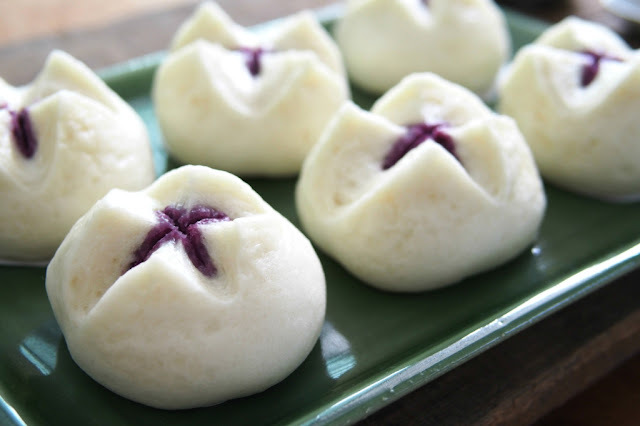 I used a Mantou recipe that I have and filled it with sweet potatoe. I found the sweet potato filling healthier as no sugar needs to be added unlike red bean or kaya. My family loved them so much they finished more than half immediately after I was done with photographing them. 1. Steam the sweet potato for about 20 minutes. 2. 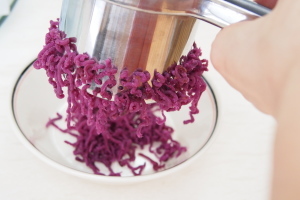 Mash them with Potato Ricer / Masher. 3. 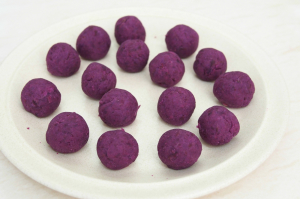 Shape the sweet potato paste to a ball. It made 16 balls. If it is too dry add a little bit of water so that easy to shape. 1. Mix all ingredients in the bowl of electric stand mixer. 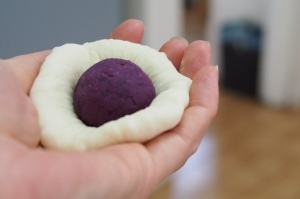 With the dough hook attached with low speed, knead the dough until the dough comes together, around 10 minutes. 2. Let the dough rest for 15 minutes in a warm place. I normally place in the oven with the oven off and door closed. 3. 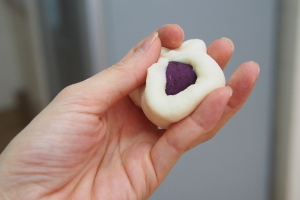 Divide the dough to 16 portions and shape each dough to a ball. 4. 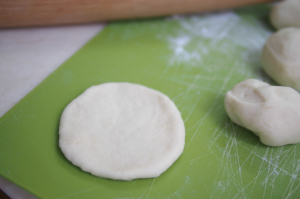 Flatten and roll out the dough into a circle. Put the sweet potato ball onto the centre of the dough and pleat up the sides and seal. Turn the buns over so that the sealed surface is underneath. 5. Place each bun onto a piece of greaseproof paper. 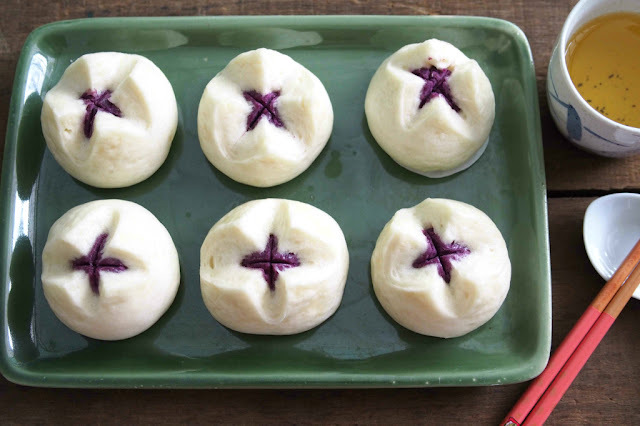 Cut a cross on top of the bun with a sharp knife and place on the rack for steaming. This is optional and you may leave them un-cut . 6. Bring the water in wok to a boiling and then steam the buns for 15 to 20 minutes. 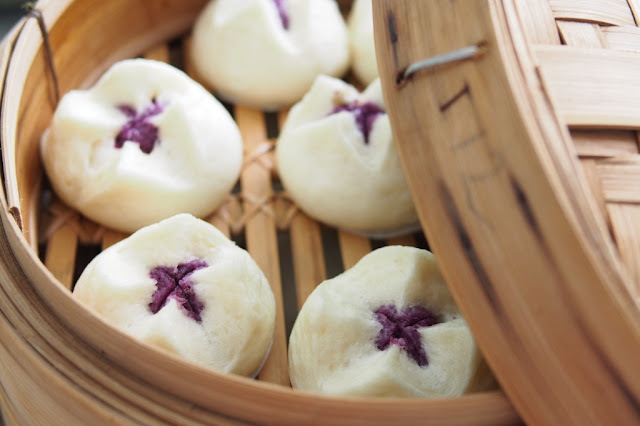 Remove the buns from steamer and serve hot. 7. These buns can be refrigerated or frozen. Just thaw them and steam for few minutes before serving.